Preheat oven to 375 degrees F. Line baking sheets with parchment paper or a silpat mat. Mix cinnamon-sugar mixture together in a small bowl and set aside. Cream butter, granulated sugar, and brown sugar together in the bowl of a stand mixer or using a hand-held mixer, about 2-3 minutes until light and fluffy. Add eggs one at a time, then add vanilla, scraping the sides and bottom of the bowl and mixing until combined. Add flour, cream of tartar, baking soda, and salt, mixing just until combined. Use a cookie to scoop out rounded balls of dough. Roll into balls and roll in a the cinnamon sugar mixture until coated, then space 2-inches apart on cookie sheets. Bake 8 to 10 minutes, until edges are set and slightly golden, even if the middle seems a bit underbaked. The cookies will continue to set as they cool. Transfer to a wire rack to cool completely. 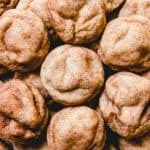 I typically do NOT chill my snickerdoodle cookie dough before rolling it into balls. It certainly doesn't hurt to chill it, and I would recommend it if you have difficulty with your cookies spreading too much or going too flat. But generally speaking, I feel like I have good results without chilling so I don't bother.